Data for the map below: The Australian Council on Healthcare Standards International respectively. To ensure patient safety and enhance service quality in hospitals, the Food and Health Bureau of the Hong Kong Special Administrative Region Government introduced the Hospital Accreditation Scheme (Pilot) in May 2009 by engaging the Australian Council on Healthcare Standards ("ACHS") as the accreditation organization. The Hospital Accreditation Scheme was officially launched in 2011, with an accreditation cycle of 4 years. All public hospitals are joining the Scheme in phases while the participation of private hospitals is voluntary. By June 2016, a total of 20 public hospitals and 10 private hospitals have participated in at least one organization-wide survey and been successfully accredited, as shown in the upper map. ACHS is accredited by the International Society for Quality in Health Care (ISQua). The lower map shows the distribution of accreditation organizations that are accredited by ISQua. As shown in the map, a majority of the accreditation organizations are located in Australia. Hospital accreditation is considered a useful measure to sustain and improve the quality for healthcare services worldwide. ACHS's accreditation encompasses both self assessment every year and external peer review every 2 years to assess the performance of a hospital in relation to established standards and to implement measures for continuous improvement. In Hong Kong, hospital accreditation was first introduced by the Food and Health Bureau in 2009. 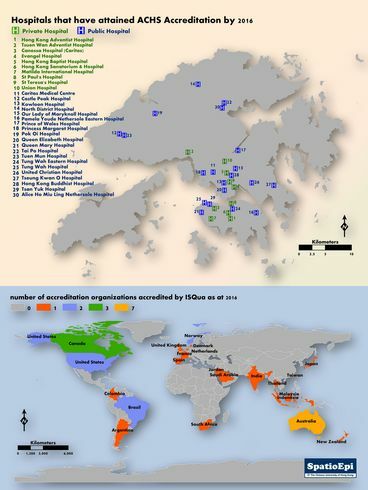 Five Public Hospitals (Caritas Medical Centre, Pamela Youde Nethersole Eastern Hospital, Queen Elizabeth Hospital, Queen Mary Hospital and Tuen Mun Hospital) and 3 private hospitals (Hong Kong Baptist Hospital, Hong Kong Sanatorium and Hospital, Union Hospital) were selected as pilot hospitals. The robustness and credibility of accreditation organization is one of the core concerns for implementing the hospital accreditation scheme. In view of this, the accreditation organization normally undergoes an assessment by a third party accreditor, and ACHS is accredited by the International Society for Quality in Health Care (ISQua). ISQua is an international organization that awards accreditation to external healthcare evaluation and standards setting bodies. It is also influential to the development in Healthcare Safety and Quality.